Have I ever mentioned before that I looooove theme parks?! Yeah, well, Everland is no exception. I love, love, loved this place. It’s quite different from all the theme parks I’ve ever been to before because of the scenery. And within the park is a mini zoo, cable cars, ski lifts and the largest wooden rollercoaster in Asia! When we visited, they were preparing for the tulip festival that happens during Spring. The place also has Ski Sledding services during winter. It was unfortunate that we came at an awkward time, because the ski sled area was closed already but spring hasn’t started yet. Anyways, even so, I still enjoyed this place. Everland, the largest theme park in South Korea, is located in Yongin City, in the province of Gyeonggi-do, about an hour to an hour and a half away from Seoul. Early monday morning we made our way to Gangnam Station (subway Line 2), and exited through exit 10. – Make your way to Gangnam Station (subway Line 2), exit through exit 10, turn left and walk for about 300 m until you reach the bus stop in front of Krispy Kreme. There is a separate queue for bus 5002, which is the public bus that goes directly to a bus terminal in Gyeonggi-do and from there you can take the shuttle bus going to Everland. – There is also an Express Bus from either City Hall or Gangnam round-trip for 12,000 Won, but this requires advance booking much like the express bus to Nami Island. Other info can be found here. A Jjimjilbang (Sauna) is a large public bathhouse segregated by gender and is furnished by sauna rooms, hot tubs, ice rooms, swimming pools and some with arcade and noraebangs or karaokes. It’s one of the unique places that you can only find in Korea. Yes saunas are not a foreign concept but a jjimjilbang is entirely different, one must definitely try it to be able to truly understand what I’m saying. And what better way to go than on a cold winter night. Most of the posts I’ve read online suggests to spend the night at a jjimjilbang to be able to truly experience it. Maybe I will try that on my next visit. It’s interesting that this is one option for budget travelers who want to save money on accommodation, you only have to pay the standard entrance fee and you can stay as long as you want to. There are a lot of jjimjilbangs all over Seoul, but we decided on Dragon Hill Spa located near Yongsan Subway Station (Subway Line 1). Exit through exit 1 and go down through the stairs. Once you reach the bottom, turn right till you reach an intersection. The spa is located on the opposite side of the road. Hongdae, yet another tourist destination in Seoul, is named after Hongik University. This neighborhood is quite famous to the youth as it is surrounded by clubs, shops, cafes and restaurants. There is a night market during weekends that showcase the works of art students from the university. There are also street performances that seems to be crowded all the time. 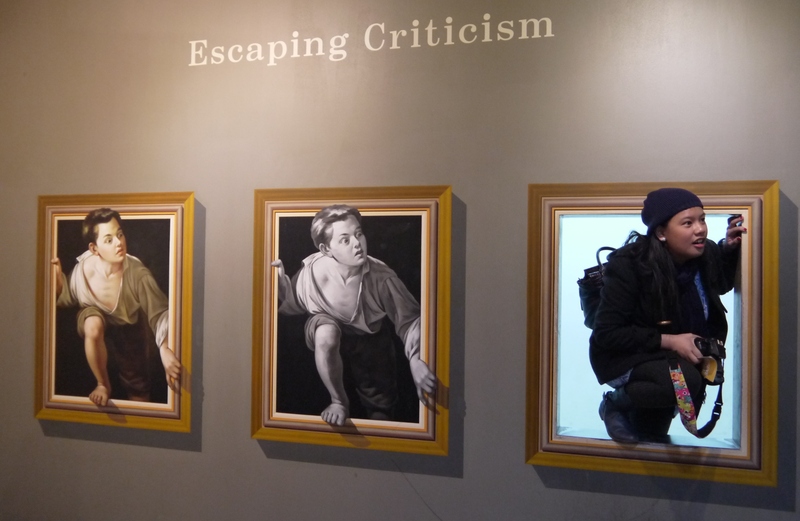 Trick Eye Museum is an art gallery that uses a special technique to make 2D paintings give the illusion of 3D. It’s interactive in a way that makes people be a part of the art pieces. It is conveniently located in Hongdae, near the Hongik University from which it was named after, at the 2nd basement floor of the Homi-hwabang building. Take Subway Line 2 to Hongik University Station and exit through exit 9. Walk straight and turn left on the street before Hotel Seokyo. The Museum is around the area behind the hotel. The entrance fee to Trick Eye Museum is 15,000 Won, which includes the entrance also to Ice Museum. I didn’t want to go to the Ice Museum but apparently there is no option to buy tickets for just the Trick Eye Museum. After going to the Gwanghwamun Square, we made our way to the Gwanghwamun Station and took the Subway Line 5 to Dongdaemun Station then transferred to Subway Line 4 to Myeong-dong Station. From Myeong-dong station, we exited through exit 3. From there we took the Namsan Cable Car Shuttle to Namsan Cable Car. There is also an option of walking up from Myeong-dong Station or taking the Sidewalk Elevator (“Ormi”). My sister didn’t know about the other options so they walked to the Namsan Cable Car on their first visit, which was an uphill climb. haha. It’s a good thing I’ve read about the free shuttle bus although next time I would like to try the Ormi. Read my previous post here. 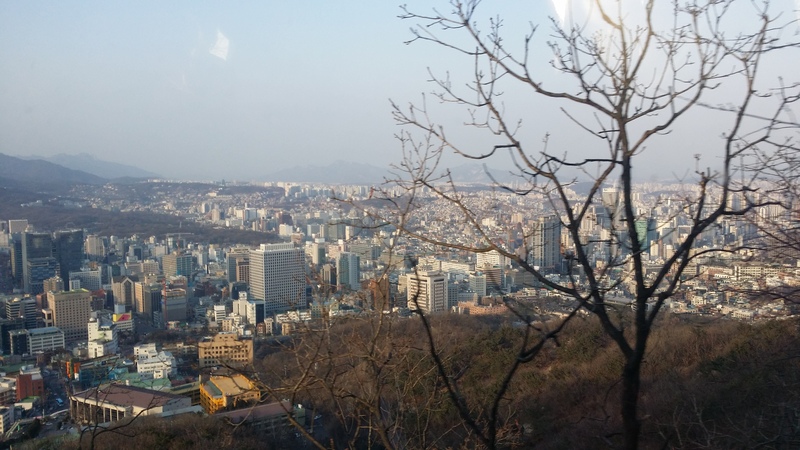 The Namsan Cable Car is the easiest way to go to Namsan Tower. If you’ve watched the Korean series “Boys over Flowers”, you would probably remember this tower in one of the scenes where the hero and heroine rode the cable car to the tower for their date. Taking the cable car provides beautiful views of Seoul anytime. The fare is 8500 Won round-trip for adults, and 6000 Won one-way. 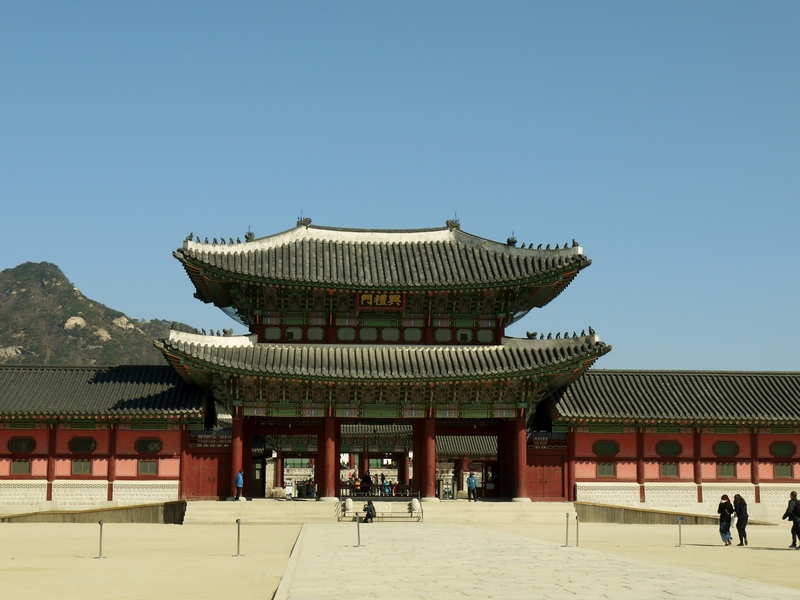 Gyeongbokgung Palace was the main royal palace of the Joseon Dynasty, and is the largest and oldest among the five Grand Palaces. 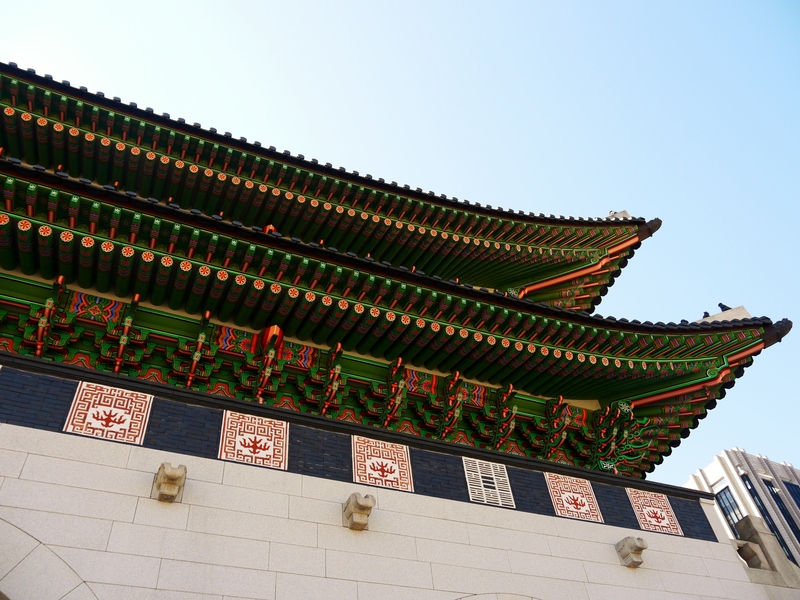 Initially, we planned to go to all the five palaces, but we decided to just go to Gyeonbokgung instead. Early morning of day 2 we made our way to the Anguk Station and boarded the Subway Line 3 to Gyeongbokgung Station. From there, we exited through exit 5 and the Palace is just a short distance away. We took photos of the facade of the gates and by the time we bought the entrance tickets (entrance fee is 3000 Won), it was time for the first Royal Changing of Guards Ceremony of the day. 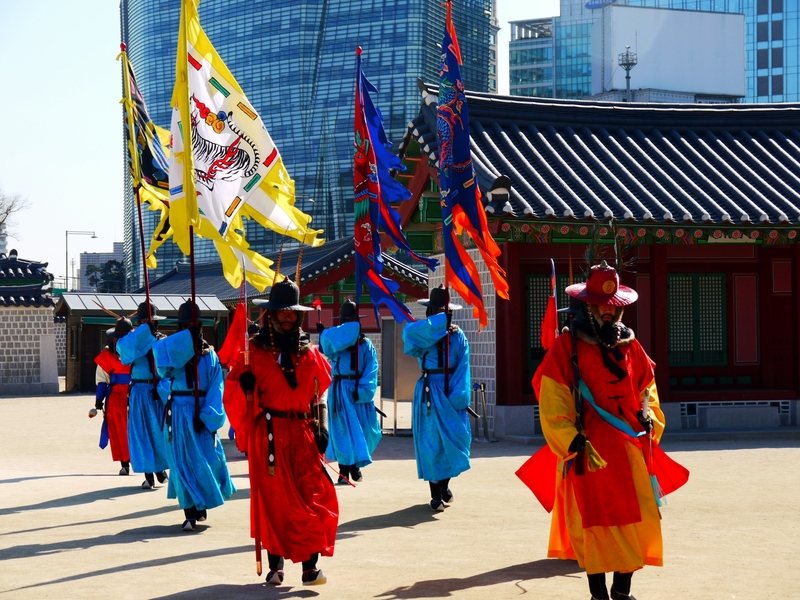 During the Joseon Dynasty, the royal guards were given the task of guarding the Gwanghwamun Gate, the entrance of the Gyeongbokgung Palace. They started to do the reenactment in 1996 for locals and foreigners to be able to experience this traditional event. They have 3 time slots for the ceremony, 11:00 am, 2:00 pm and 4:00 pm, and the Palace is closed on Tuesdays. There is also a booth opposite the ticket booth that is solely for letting tourists experience wearing the royal guards clothes. It’s a wonderful opportunity to get the feel of their uniforms. We kept laughing because my dad became embarrassed to wear the costume coz he said he feels like a gay wearing one (it looks like a dress). After the costume experience we entered the palace premises. It was quite big and after a lot of photo-taking, we exited in time for the 2nd Guard Changing Ceremony.